Brenda Sullivan Hensley, 61, of Louisville, Kentucky, passed away on Thursday, April 11, 2019. She was born on May 17, 1957 in Louisville, Kentucky to Warren and Shirley Sullivan. Brenda enjoyed ghost hunting and cemeteries. Brenda also liked spending her time gardening flower gardens. She enjoyed spending time with her grandkids and family. Brenda is preceded in death by her Father, Warren Sullivan, Significant Other, Bige Hensley, and Brother, Philip Sullivan. 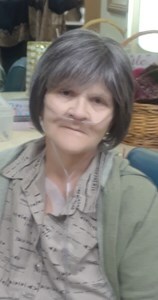 Brenda is survived by her Mother, Shirley Sullivan, Daughter, Dorothy Carpenter, Grandchild, Bailey Carpenter, Grandchild, Colby Carpenter, Sisters, Debbie Hoffman and Mary Tracey, Brothers, Mike (Debbie) Sullivan and John (Charri) Sullivan, Niece, Catt Sullivan and Nephews, Phil Sullivan and Brian Sullivan. Visitation will be from 4:00 pm to 8:00 pm on Monday, April 15, 2019 at Newcomer Cremations, Funerals & Receptions - Southwest Louisville Chapel, (10304 Dixie Hwy). Her Funeral Service will be at 6:00 pm on Monday at the funeral home with visitation to continue after the service. Per Brenda's wishes cremation services are to follow. The family requests that contributions in Brenda’s memory be made to the family or the funeral home to help with final expenses. Add your memories to the guest book of Brenda Sullivan Hensley. Well Bennie, I don't even know where to begin or what to say. I just can't believe that you are gone. We were just joking to eachother that Wednesday night. I was hoping this was all a dream, but when i saw you laying there, i knew it wasn't. I was so damn mad for you leaving. You promised me and Sophie that you wouldn't. We had our plans to go to the zoo soon, plus our little road trips we were about to take and your bucket list you had wrote out. Sophie keeps saying how she wants to go see and play with her Bennie. I tried to explain to her that you are up in heaven now and how you are a star that comes out at night. So every night we have to go outside so she can wave at a star that she picks and says that's you. She says I want to go up to the sky so I can see my Bennie. Went to grandma's the other day and again today. First thing she said is where is Bennie. Then I have to tell her where you are and she says yes Bennie is in the sky. It's so damn hard. And it breaks my heart all over again. When you died you took a big piece of me with you. I don't know how I'm going to get threw this or even mom and Dorothy. We all miss you so very much. Tomorrow we will be saying our final goodbyes to you and I'm not ready for that. A few times I started to text you and then I had to remind myself that I can't. I keep trying to tell myself that you are in a better place, that your not in anymore pain and that your up in heaven with Bige now. But I wish I could be selfish and still have you here. Who am I gonna talk about too now lol. Who is going to listen to my craziness and my little rants? What am I suppose to do without you? I'm just so loss right now. Hell this was one way to get out of cooking that damn Easter dinner that you didn't want to do huh? LOL I hope you know how much you mean to me and how much I have appreciated all the things you have done for me my whole life and for Sophie.. I love you to the moon back. I miss you sis. It's just seems so unreal to me. Talking one day and gone they next. But I know your up there with Dad and the love of your life bige. And papaw and grandma's and Philip. We have Missed out on a lot. But I'm so glad for the time we had. Love sis til we meet again. Wow you was like a sister to me. Your brother was married to my cousin for many years they had a son which became your nephew. You and I have always had such a close Bond. I am so sorry that I have not got to come and see you as often as I wanted. Brenda I love you so much and I'm going to miss you so dearly. I know your heart has been grieving since your beloved Bige passed out of this world! You never did complain lady! You were always so thoughtful of many! I use to love sleeping on your couch and eating your food! Because you was always such a good cook! Thank you again dearly for all the times you babysitted my grandchildren! I always took great pleasure in watching your cats and Watering your plants when you went to Elkhart & I enjoyed the 2 times that I took you to Elkhart! Rest easy my friend until we meet again! I miss you so much. I still can't wrap my mind around this. But I know you are with Dad, Bige, Phil and grandmas and grandpas. one day I know you will be there to greet me, when its my time to come home. I ask that you watch over us as our guardian angel. Luv ya sis.